Helicopters present the perfect solution for lifting heavy loads. At HeliSpirit, we provide practical solutions for a vast array of specialised projects. Our expertise lies in the transportation, handling and installation of heavy items. Our fleet of helicopters provide cost effective transportation compared to conventional ground cranes. Construction projects face numerous challenges. One of which is getting the crew and necessary materials transported. It becomes even more of a challenge when ground vehicles are ineffective or unable to reach remote areas. Our extensive experience in these situations allows us to provide helicopter lifting services that are designed to meet specific requirements. 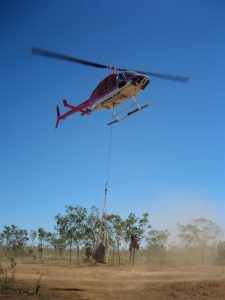 Our crew are highly skilled to handle a range of projects from flying sling loads for mining support to offering fire fightingervices in remote areas. Aerial cranes offer numerous applications and can be used for more than simply transporting equipment on construction sites. We can provide a cost effective solution with both piston and turbine hook-equipped helicopters. We have provided quality heavy lifting services for numerous clients throughout Australia and can provide a practical solution that meets your needs. Read about one of our aerial crane tasks here. Contact our friendly team on 08 9168 1110 to get a solution for your heavy lifting.